Compact mirrors make great bridesmaid gifts. You can find several styles of compact mirrors from Victorian to ultra sleek modern designs. Engraving each with your bridesmaids' initials is just one way to personalize this thank you gift. Traditionally, the bride presents each of her bridesmaids with a small gift to thank them for playing an important role in making her wedding a special occasion. A compact mirror makes a great bridesmaid gift for several reasons. Compact mirrors are usually fairly inexpensive, making them an ideal gift choice for the bride on a tight budget. For most mirror styles, you can add optional engraving for a personal touch. If you present the gift to your bridesmaids before the big day, they can use their new mirrors to touch up their makeup between your bridesmaid photos, ceremony, and the wedding reception. A mirror is a pretty, yet practical, gift that your bridesmaids can use long after your wedding day has passed. If you're having trouble finding the right gift at your local mall, you can order compact mirrors for your bridesmaids by visiting the following online retailers. American Bridal has an assortment of mirrors that make great gifts for the women in your bridal party. There are plain round silver mirrors as well as more elaborate designs with rhinestones. Red Envelope has a large selection of bridesmaid's gifts that includes several compact mirror styles, most of which are exclusive to the company. Rumors has compact mirrors featuring attractive details such as a mother of pearl finish, filigree, and rhinestone hearts. Gunther Gifts has a complete selection of gifts for your bridal party, including whimsical compact mirrors that feature a playful illustration of a happy bridesmaid. 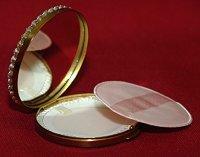 Future Memories has simple and inexpensive compact mirrors for thrifty brides. My Wedding Accents has a number of necessary items for your special day, including gifts for all of the members of your bridal party. If you do decide to order your compact mirror bridesmaid gifts online, make sure you plan ahead. Place your order as early as possible to avoid any unexpected shipping delays or problems caused by faulty merchandise. Of course, it's also a good idea to proofread your order several times to make sure you haven't accidentally misspelled someone's name or created an embarrassing typo on the mirror's inscription. In many cases, you can purchase these items from the same place as personalized mirrors. Contrary to popular belief, there is no standard time to present bridesmaids with their gifts. Many brides simply opt to give gifts before the wedding ceremony, but this is usually a very hectic time. If you'd like to make the gift giving ritual a bit more special, consider giving the gifts at your wedding rehearsal dinner. Include a special handwritten note thanking each bridesmaid for her friendship and support during this important time in your life. Or, for a complete surprise, present your bridesmaids with their gifts at the end of your bridal shower. Since hosting this event is a huge responsibility and the day is traditionally all about the bride, they will be touched by your thoughtfulness. Compact mirror bridesmaid gifts are both thoughtful and practical, and they offer a small token of thanks to the women who give so much to the bride during this special time.